NEVERMORE New Years Eve 2016: Thurs, Dec 31 @9pm. The 8th annual Charm City Countdown returns again to the gorgeous Radisson North Baltimore Hotel. Join over 1500 people at this year's themed, all-inclusive NYE 2016 Nevermore Masquerade Ball with tickets on sale now at their lowest prices. 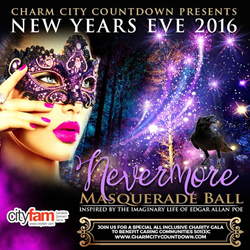 Nevermore NYE 2016- The 8th annual Charm City Countdown returns again to the gorgeous Radisson North Baltimore Hotel. "As far as I know this is the first ever Poe themed New Year's Eve event"; "Guests will enjoy an enchanted evening as they are taken on an unforgettable journey"
CityFam presents, "Once upon a midnight dreary…"
Inspired by Baltimore’s favorite poem The Raven, Charm City Countdown is celebrating 2016 with their 8th annual New Year’s Eve Party with a Nevermore Masquerade Ball. As always, this event will directly benefit Caring Communities, a non-profit based in Maryland, and children with disabilities. The Ball kicks off at 9pm at the newly remodeled Radisson North Baltimore Hotel, formerly the North Baltimore Plaza Hotel, and will continue until 2am. "Guests will enjoy an enchanted evening as they are taken on an unforgettable journey" says Mona Freedman owner of Caring Communities, the 501(c) 3 that the event benefits. It is sure to be an exciting way to bring in the New Year with thrilling party zones reflecting the imagination of Edgar Allen Poe, live entertainment from twelve amazing acts, multiple buffets with a truly impressive menu and more. "As far as I know this is the first ever Poe themed New Year's Eve event" says Rob Kowalski owner of CityFam, one of the event's organizer's. Masquerade Balls, and many of Poe’s stories and poems, blurs the line between fact and fiction and are full of interesting characters who danced to the beat of their own drums. So, embrace our fantasy theme, and feel free to recreate your own interesting characters from nighttime Baltimore. Evening gowns, shark skin jackets, spike heels with fishnet stockings, tuxedos, or cowboy boots will all be equally welcome and expected! But please, no T’s, jeans, or sneakers. The ticket price covers everything: dinner, all-night drinks, dancing, and more. VIP tickets are available with upgraded menu, ultra premium bar, exclusive entertainment options and expanded seating. To ensure their enjoyment of all the New Year Festivities, the Hotel is offering a reduced price on rooms for all guests. So come celebrate the New Year through the fantasies of Baltimore’s enigmatic writer who has fascinated the world for the last century; Edgar Allen Poe!